Giuseppe Arcimboldo, Summer, 1573, oil on canvas, Museé du Louvre, Paris. For my first official piece of artwork on my blog voyage, I decided to pick something a little whimsical and not so pretentious since first impressions are everything. I chose Arcimboldo’s Summer in hopes to prove that my approach to art will be just that, approachable. I’m not here to patronize, just enlighten. And as I hope to enlighten the blogging world, this personification of summer by Arcimboldo was a reaction to an enlightenment going on at the time, commonly known as The Renaissance. The usage of fruit, wheat, veggies and flowers in this portrait is a twist on art that could be questionable to some art critics. Arcimboldo could have very well been nuts. However, that’s not for us to judge. I like to think that this piece was probably edgy for the 1500’s which is always in. At first glance this portrait says “scarecrow” to me. This could be because of the organic nature of “summer’s” facial features and, the tip off, wheat peeking out from the top of the potato sack reminiscent collar. Either way, I love how organic the figure is. “Summer’s” face has soft round lines thanks to the curvatures of the peach. The personification’s hair seems to fall perfectly like a halo with the mixture of soft leaves, cherry fillers and cowlick-like corn husks. There’s something so effortless about this meticulously contrived painting. 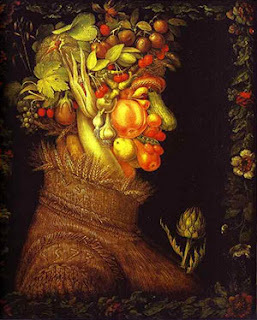 Summer was received well by the 16th century but hype fizzled out after Arcimboldo’s death. When the 20th century rolled around, surrealist artists, novelists and film makers stumbled upon his work again and were inspired by Arcimboldo’s inventive paintings.